The lights of a television studio illuminate the action in Super Star Turns, an online slot machine from Barcrest offering multiple Wheels of Fortune and the proprietary Big Bet option – find out how it all works below. 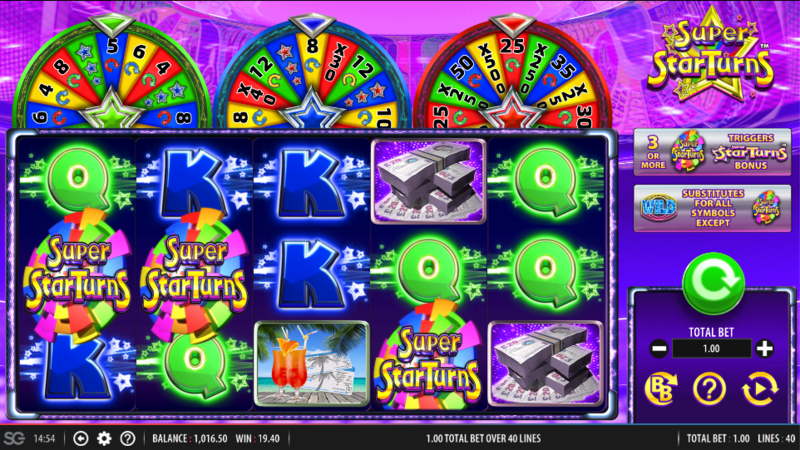 Super Star Turns is a five reel slot with three rows and forty fixed paylines; the brightly-coloured screen contains the reels surrounded by glowing lights underneath the three wheels which become useful during the main feature. Symbols of luxury including fast cars, piles of cash, champagne and cocktails represent the higher values while Q, K and A make up the lower values. The wild is a shimmering, blue ‘Wild’ which will replace all standard symbols while the Super Star Turns logo is the bonus icon. This is triggered by landing three, four or five of the Super Star Turns bonus symbols anywhere in view for which you will receive a spin on the green, blue or red wheels respectively – they get progressively more rewarding with more spins and cash prizes available. Landing on the right segment on the green or blue wheels can also award another spin on the next wheel up. There’s a potential 50 free spins available and a cash prize of up to 500x your total bet if you’re lucky enough to be using the red wheel. When the free spins are eventually underway they are played on a set of reels with Q, K and A removed; the bonus symbol appears stacked and only on reel five during this round and landing one, two or three in view will award an extra one, two or three free spins. £20.00 – bonus symbols are two positions high. £30.00 – bonus symbols are two positions high plus bigger rewards in the feature. £50.00 – bonus symbols are two positions high plus even bigger rewards in the feature. 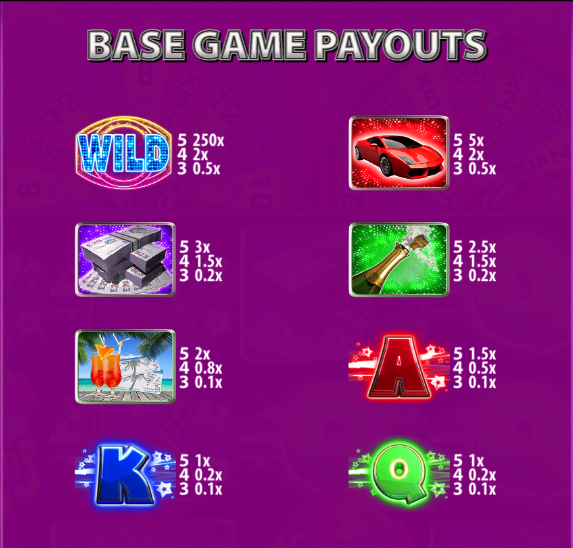 In addition base game payouts increase with each Big Bet choice. Super Star Turns may not be the most graphically advanced slot we’ve ever played but it’s action packed and comes with a tempting free spins round along with the ever-popular Big Bet so try it out! As with all Big Bet games, the RTP increases with the bigger stakes from 94.00% up to 98.00%.